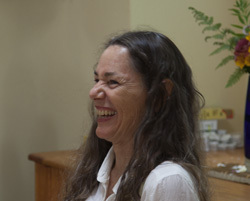 Artist and teacher Allison Atwill Roshi leads Coral Moon Zen, a Pacific Zen Institute practice center. At Coral Moon Zen you’ll find a community of people exploring the path of meditation, koan practice, creativity and freedom inside our own lives, and a space for open conversation about the journey. Brightness appears through whatever is in front of us, whether beautiful or difficult. The Zen tradition holds the image of the Bodhisattva as its central deity- placing wholeness over perfection, discovery over self-improvement. Zen meditation and the images and language of koans offer a way of moving in the dark and trusting in the uncertainty at the heart of every moment of life. We offer regular Thursday evening and Sunday morning gatherings as well as one-day retreats. Contact us for more information or to join our mailing list.